Laboratory batch sorption experiments were used to investigate variations in the retardation behavior of redox-sensitive radionuclides. Water-rock compositions were designed to simulate subsurface conditions at the Nevada Test Site (NTS), where a suite of radionuclides were deposited as a result of underground nuclear testing. Experimental redox conditions were controlled by varying the oxygen content inside an enclosed glove box and by adding reductants into the testing solutions. Under atmospheric (oxidizing) conditions, radionuclide distribution coefficients varied with the mineralogic composition of the sorbent and the water chemistry. Under reducing conditions, distribution coefficients showed marked increases for 99Tc (from 1.22 at oxidizing to 378 mL/g at mildly reducing conditions) and 237Np (an increase from 4.6 to 930 mL/g) in devitrified tuff, but much smaller variations in alluvium, carbonate rock, and zeolitic tuff. This effect was particularly important for 99Tc, which tends to be mobile under oxidizing conditions. A review of the literature suggests that iodine sorption should decrease under reducing conditions when I- is the predominant species; this was not consistently observed in batch tests. Overall, sorption of U to alluvium, devitrified tuff, and zeolitic tuff under atmospheric conditions was less than in the glove-box tests. However, the mildly reducing conditions achieved here were not likely to result in substantial U(VI) reduction to U(IV). Sorption of Pu was not affected by the decreasing Eh conditions achieved in this study, as the predominant sorbed Pu species in all conditions was expected to be the low-solubility and strongly sorbing Pu(OH)4. Depending on the aquifer lithology, the occurrence of reducing conditions along a groundwater flowpath could potentially contribute to the retardation of redox-sensitive radionuclides 99Tc and 237Np, which are commonly identified as long-term dose contributors in the risk assessment in various radionuclide environmental contamination scenarios. The implications for increased sorption of 99Tc and 237Np to devitrified tuff under reducing conditions are significant as the fractured devitrified tuff serves as important water flow path at the NTS and the horizon for a proposed repository to store high-level nuclear waste at Yucca Mountain. Major sources of radioactive waste and contamination include the production of nuclear fuels for the weapons program and electricity generation, nuclear weapons tests, fuel reprocessing, and nuclear accidents. In the United States, the total volume of all radioactive waste is 5.5 million m3, with a total activity of about 1.2 × 109 TBq (tera becquerel; 1 TBq = 27.03 Ci) . In addition, there are large volumes of radiologically contaminated soil (30–80 million m3) and water (1,800–4,700 million m3), especially at U.S. Department of Energy (DOE) facilities that were used for nuclear weapons production . The Nevada Test Site (NTS) is one such DOE facility, with substantial radiologic contamination resulting from nuclear weapons testing and also the location of the proposed Yucca Mountain geological repository for high-level nuclear waste, which has been the focus of radionuclide transport investigations for more than three decades. Numerous long-lived radionuclides are present in groundwater at the NTS as a result of 828 underground nuclear weapons tests conducted between 1951 and 1992. When weapons testing ended in September 1992, a total of about 4.9 × 106 TBq of radioactivity was present in the subsurface . Important radionuclides, in terms of abundance, half-life, environmental mobility, and health effects, include 3H (tritium), 14C (carbon), 36Cl (chlorine), 90Sr (strontium), 99Tc (technetium), 129I (iodine), 137Cs (cesium), 237Np (neptunium), as well as isotopes of uranium (U), plutonium (Pu), and americium (Am). These radionuclides have been commonly identified as the set of contaminants that would cause risk to human health and the environment within the time frame of interest (1,000 years) for the environmental monitoring program at the NTS . Among them, 3H, 14C, 36Cl, 99Tc, and 129I presumably have large migration potential due to a minimal interaction with the subsurface media. The objective of the laboratory study described below is to use batch sorption experiments to investigate the impact of groundwater redox conditions on the mobility of selected radionuclides. Thus far, laboratory sorption data acquired for the radionuclide transport at the NTS has been based upon experiments conducted under atmospheric (oxidizing) conditions mainly because of the simplicity of the tests and the considerations that the NTS has primarily oxidizing groundwaters. While this is also true for most of the radionuclide sorption data available in the literature, biotic or abiotic reductive immobilization of radionuclides (U in particular) has gained interest in recent years [e.g. [5, 6]]. For this investigation, we conducted a series of batch studies to evaluate the sorption behavior of redox-sensitive radionuclides (Tc, I, U, Np and Pu) under a range of redox conditions spanning those observed in NTS monitoring wells. Some radionuclides that are not redox-sensitive (e.g., Sr and Cs) were also included for comparison. The experiments were conducted using four different types of aquifer materials (alluvium, carbonate rock, devitrified tuff, and zeolitic tuff). Batch sorption experiments were conducted under atmospheric (oxidizing) conditions and in a glove box under five different controlled redox conditions spanning the range from oxidizing to moderately reducing. When studying field-scale radionuclide transport, a distribution coefficients (K d ) approach has been commonly employed to quantify the extent of radionuclide-aquifer-groundwater interaction. Values of K d , a ratio of the sorbed phase concentration to the solution phase concentration at equilibrium, are used in transport simulations to empirically describe radionuclide/aquifer interactions that are the source of retardation for sorbing radionuclides. The K d data are commonly determined from laboratory-scale batch and column experiments under oxidizing conditions  or computed by upscaling mechanistic processes . The term sorption is loosely used in this work to describe the concentration decrease in the solution phase of radionuclides, which could include sorption onto the solid as well as surface precipitation. Table 1 shows the range in measured K d values for eight radionuclides for representative geologic media, including alluvium, carbonate rock, and volcanic tuffs (devitrified, vitric, and zeolitic) encountered at the NTS . Generally speaking, the largest K d values are observed in the zeolitic tuff and in alluvium, and the smallest values in vitric tuff. Sorption of Pu and Am onto carbonate rock is appreciable, and Np sorption to carbonate rock is higher than other rock types (Table 1). The K d values for Tc and I in Table 1 are based on the assumption that pertechnetate (TcO4-) and iodide (I-) are the dominant species in groundwater and during experimental measurements . However, these and several of the other radionuclides listed in Table 1 (i.e., Tc, I, Np, U, and Pu) are redox-sensitive, and the speciation and retardation of these radionuclides is sensitive to their oxidation state. Variations in groundwater redox conditions, and associated changes in retardation factors are of particular importance to presumably mobile radionuclides, such as 99Tc; reducing conditions could result in much longer transport times than those predicted with minimal retardation (i.e., K d close to zero). Technetium exists in valence states ranging from +7 to -1, but in natural environments, the most stable valence states are +7 and +4 under oxidizing and reducing conditions, respectively. 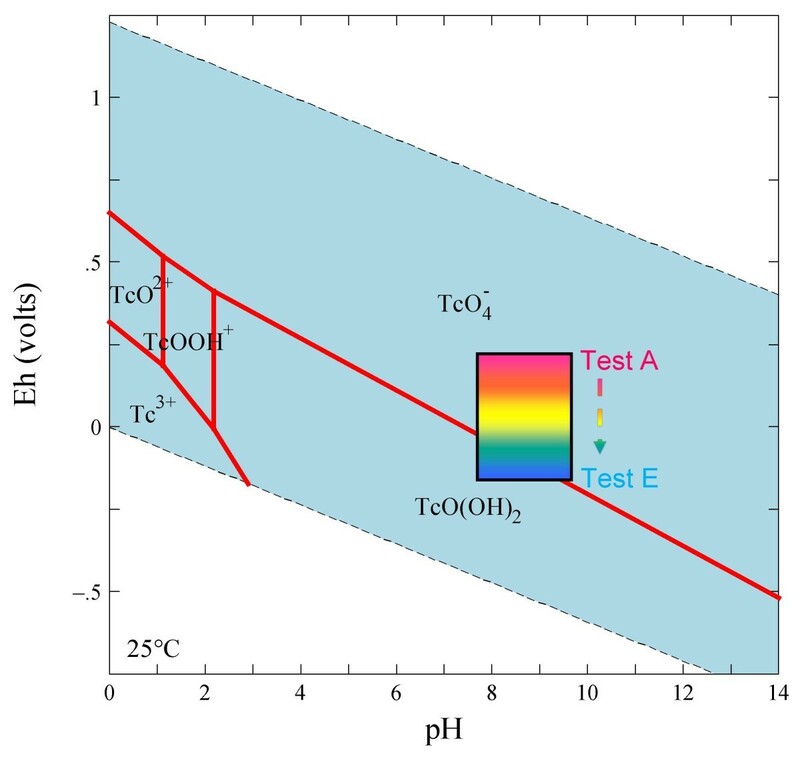 Technetium forms a reduced species [predominantly Tc(IV)] at redox potential (Eh) values below about 220 mV with respect to standard hydrogen electrode (SHE) in neutral pH conditions (Figure 1) . At higher Eh, it occurs as Tc(VII)O4-. Due to its weak interaction with mineral surfaces, TcO4- is considered as one of the most mobile radionuclides in the environment. In contrast, lower-valence Tc(IV) species [such as TcO2·nH2O with n = 1–2; equivalent to TcO(OH)2° in Figure 1 when n = 1] are expected to be strongly retarded due to their strong sorption and/or precipitation; the solubility of TcO2·nH2O(s) in carbonate-containing groundwater was reported to be about 10-8 M [10, 11]. Eh-pH diagram drawn at 25°C and an equilibrium activity of 10 -11 for technetium; stability fields are shown only for the aqueous species. Diagram was produced using the "thermo" database in the Geochemist's Workbench (version 6.0). Hatched areas are the measured Eh-pH region for Tests A-E conducted in this work. The presence of reductants in the host rock (e.g., Fe(II) in pyrite FeS2) can contribute to the reduction of Tc(VII) to Tc(IV) . For example, reducing groundwater was observed in boreholes on or near Yucca Mountain, in the western part of the NTS, several of which are known to contain pyrite . Recent work of Hu et al. indicated that the groundwater in the deep NTS aquifer exhibited variable redox conditions. Under reducing conditions, Cui and Eriksen [15, 16] reported that TcO4- was reduced to TcO2·nH2O(s) by Fe(II)-bearing fracture-filling minerals on which Tc(IV)aq was rapidly sorbed. Reduction of Tc(VII) to Tc(IV) occurred with Fe(II)-containing solid phases but not by aqueous Fe(II) species [11, 17–19]. Peretyazhko et al. recently demonstrated that mineral-associated Fe(II) can be an effective heterogeneous reductant of Tc(VII) under anoxic conditions, yielding insoluble Tc(IV) precipitates, coprecipitates, and/or surface complexes that may significantly retard Tc migration. Their experimental results suggested the following affinity series for heterogeneous Tc(VII) reduction by Fe(II): Fe(II) adsorbed on Fe(III) oxides >> structural Fe(II) in phyllosilicates >> adsorbed Fe(II) in phyllosilicates [ion-exchangeable and some edge-complexed Fe(II)] ~aqueous Fe(II). Lieser and Bauscher  observed wide variations in 99Tc distribution coefficients for sediment-water experiments performed under aerobic and anaerobic conditions. By varying the redox potential, they observed a change in the K d by about 3 orders of magnitude within a small range of Eh at 190 ± 30 mV for a pH of 7 ± 0.5. Chemical equilibrium modeling using EQ3/6 software has also shown the enhanced retardation of 99Tc under reducing conditions in the saturated zone at Yucca Mountain . To summarize, 99Tc can behave as either a non-sorbing species (like chloride) or a strongly sorbing species (like Am) – simply because of a modest change in redox conditions. The assumption that 99Tc will always behave as a mobile species oversimplifies its geochemical behavior and may overestimate its transport rates. The fate and transport of 129I in groundwater is also dictated by its chemical speciation. Aqueous iodine usually occurs as the highly mobile iodide anion (I-). Under more oxidizing conditions, iodine will be present as the iodate anion (IO3-), which is more reactive than iodide and could be sorbed onto positively-charged sites locally existing in clays and organic matter [21, 22]. Unlike other redox-sensitive radionuclides (such as 99Tc), iodine sorption may decrease under reducing conditions when I- is the predominant species [cf., ]. However, coexistence of several iodine species (iodide, iodate, and organic iodine species) has been reported in various aqueous systems, which will tend to make the sorption behavior of iodine more difficult to predict. A large volume of literature exists on the geochemical behavior of actinides in the environment; topical review papers include Kim , Dozol and Hagemann , Silva and Nitsche , and Kersting and Reimus . In general, the mobility of actinides in aqueous systems is dependent on (1) their thermodynamic properties, which determine solubility and speciation as a function of pH and redox potential, (2) the availability of inorganic and organic ligands to form soluble complexes, and (3) the composition and abundance of minerals and mineral colloids present in the system. The valence state of redox sensitive radionuclides (including U, Np and Pu) plays a major role in defining the geochemical reactions and migration behavior of these elements. Solubility-limited concentrations, complexation reactions, sorption onto minerals, and colloid formation all differ considerably as a function of oxidation state . The chemistry of uranium in the environment is dominated by the difference in behavior of the U(IV) and U(VI) ions. The tetravalent form generally has low solubility while the hexavalent form is relatively soluble as the uranyl (UO22+) ion and its complexes . As shown in Figure 2, the uranyl ion commonly forms soluble complexes with carbonate ligands at pH values typical of NTS groundwaters [30, 31]. Even at relatively low oxidation potentials, uranyl species may dominate aqueous uranium speciation, although uraninite (UO2) is the stable solid phase. Uranium is more readily sorbed onto minerals or organic matter when present as the positively charged uranyl species, and this step may precede reduction to less soluble U(IV) solids [32–35]. However, the strong affinity of carbonate ligands for uranyl [e.g., ] in solution effectively competes with sorption, thereby limiting the sorption of uranyl carbonate complexes . Eh-pH diagrams drawn at 25°C and a species activity of 10 -13 M for uranium in J-13 water. An important feature of neptunium chemistry in aqueous systems is the large stability range for Np(V) . The pentavalent NpO2+ species is dominant at pH values < 8 whereas Np(V) carbonate complexes tend to dominate at higher pH values  (Figure 3). Since Np(V) solid phases are relatively soluble and Np(V) aqueous species sorb weakly onto common minerals, Np(V) is relatively mobile in the environment. Under reducing conditions, Np(IV) is present as the low solubility Np(OH)4 (aq) species at pH values > 5 . Np(IV) shows a strong tendency for sorption to mineral surfaces [37, 38], which limits its mobility in aqueous systems. Eh-pH diagrams drawn at 25°C and a species activity of 10 -13 M for neptunium in J-13 water. The redox speciation of plutonium is affected by a number of competing variables, and Pu is observed to coexist in multiple valence states in natural waters  (Figure 4; note that the stability fields are shown only for the aqueous species). Pu(III) and Pu(IV) tend to be less stable than Pu(V) and Pu(VI) under oxidizing, near-neutral pH conditions, though Pu(IV) exhibits the strongest tendency to form ligand complexes . The aqueous chemistry of plutonium is further complicated by the fact that Pu(IV) disproportionates to Pu(III) and Pu(VI), Pu(V) disproportionates to Pu(IV) and Pu(VI), and Pu(VI) is easily reduced [41, 42]. Kersting and Reimus  showed that Pu(V) reduction to Pu(IV) is an important mechanism for Pu sorption to mineral surfaces. Eh-pH diagrams drawn at 25°C and a species activity of 10 -13 M for plutonium in J-13 water. Figure 5 summarizes the valence states for several radionuclides as a function of redox potentials, and the figure also includes the expected equilibrium redox potentials associated with the common electron-acceptor couples encountered in groundwater . In the laboratory experiments conducted during this study, the redox conditions were controlled by modifying the oxygen concentration in air, and by spiking the solutions with Fe2+ and S2-. 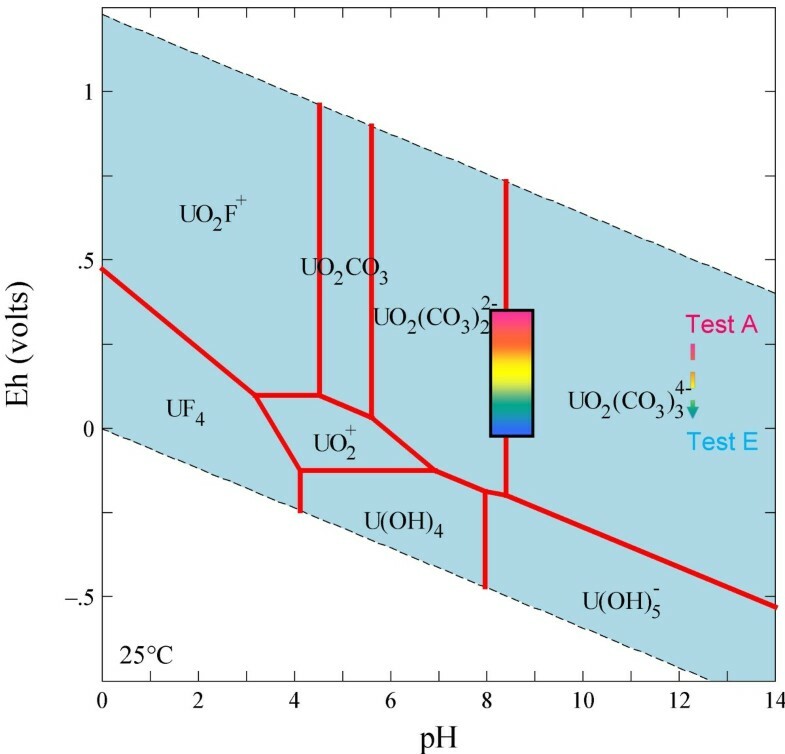 Expected dominant oxidation states of the radionuclides as a function of standard redox potential under pH 7 in J-13 water at equilibrium with atmospheric CO 2 . Arrows at the top of the figure show the expected redox potentials for common redox couples in the groundwater. This figure was modified from Banaszak et al ; results for a pH ~ 9 under which the experiments were conducted in this study will shift the oxidation state boundaries to lower values of Eh. The extent of radionuclide sorption is dependent on the physical and chemical properties of the radionuclide-aquifer-groundwater system. The lithologic (aquifer) materials used in this study included alluvium, welded/devitrified tuff, zeolitic tuff, and carbonate rock. All lithologic materials were crushed and sieved to a 75–500 μm size range . The alluvium was collected from an exposed section of the U-1a.102 drift in the U-1a tunnel complex (at a depth of 295 m below the land surface) beneath Yucca Flat. The devitrified tuff sample was a Topopah Spring welded volcanic tuff collected from the Yucca Mountain tunnel (~300 m below ground surface). The original glassy matrix in this material has altered to fine-grained crystalline solids that include feldspar, quartz, cristobalite, and some smectite . The zeolitic tuff sample was from drill core UE-7az (496 m below ground surface) within the tuff confining unit (TCU) of Yucca Flat. Zeolitic tuff is formed by the alteration of glassy vitric tuff near and below the water table , and is typically comprised of clinoptilolite (> 60%), mordenite, opal, feldspar, and quartz. The carbonate rock was from drill core ER-6-1 (833 m below ground surface) within the lower carbonate aquifer (LCA) at Yucca Flat, and consists of massive dolomite with calcite veinlets. A companion synthetic groundwater was used for each solid matrix. Synthetic LCA (Ca-Mg-HCO3) and TCU (Na-K-HCO3) waters were used in carbonate rock and zeolitic tuff sorption experiments, respectively. The solution compositions were based on measured concentrations of major ions in groundwaters sampled from the respective hydrostratigraphic units, except that sulfate, nitrate, and fluoride were omitted from the background solution because of their minimal role in radionuclide retardation processes. Synthetic J-13 water (Na-K-HCO3 type) was used for the sorption of radionuclides onto alluvium and devitrified tuff. According to the thermodynamic database "thermo" in the Geochemist's Workbench, a solution composed of J-13 water should be supersaturated with respect to a number of phases, including calcite . To avoid potential mineral precipitation issues, synthetic J-13 water was prepared using a recipe from Viani  that is predicted to be stable at 25°C and atmospheric pCO2. Measured concentrations of constituents in the prepared synthetic background waters are presented in Table 2.
a Estimated from the charge balance. The radionuclides and surrogate species used in the batch-sorption experiments were chosen because they represent a significant fraction of the radiologic source term at the NTS, and are expected to show a wide range of radionuclide retardation behavior. Synthetic groundwaters were spiked with radionuclides and surrogate species at the appropriate amount to achieve the target concentration (Table 3). The target concentration was based on a combination of instrument detection limits, expected background concentrations, and solubility limits. Tables 3A, 3B, and 3C summarize the measured radionuclide compositions of spiked blank solutions. The radionuclide stock solutions (99Tc, 237Np, and Pu) were stored in a HNO3 matrix. When spiking samples, a small amount of NH4OH was added to minimize pH changes to solutions. a Average concentration (mol/L) in parentheses. U(VI) was assumed to be the dominant U species in the stock solution based on its stability under oxidizing conditions. The Pu stock solution was purified using a TEVA column. The oxidation state of the Pu stock solution was characterized using both solvent extraction with PMBP (4-benzoyl-3-methyl-1-phenyl-2-pyrozolln-5-one) as described in [47–50] and Pu co-precipitation by lanthanum fluoride . The results indicated that the Pu stock solution consisted of 80% Pu(IV), 15% Pu(III) and 5% colloidal Pu. The 237Np stock was purified in concentrated HCl with KI solid using an AG1 × 8 (100–200 mesh) resin column. The Np was eluted from the column using 0.1 M HNO3. The Np solution was dried in HNO3 on a hotplate before re-dissolving in 1 M HCl to make a Np(V) solution. Np(V) oxidation state of the stock solution was confirmed by UV/VIS spectrometry. Chemical forms used in the initial solution were Sr2+, Cs+, I-, 99TcO4-, and ReO4-. Valence states for the actinides were U(VI), 237Np(V), and Pu(IV); the predominant chemical forms are expected to be carbonate and/or hydroxide complexes for U, Np, and Pu. These are the valence states and chemical forms expected to occur in the oxidizing groundwaters at the NTS. Cs and Sr are not subject to changes in oxidation state and were included for comparison. ReO4- is sometimes used as the surrogate for TcO4- based on their similar crystal chemistry, electronic configuration, and thermodynamic data [52–54]. However, there is a difference between Re and Tc in their respective oxidation potentials. A comparison of the Eh-pH diagrams for Re and Tc shows that ReO4- is in equilibrium with ReO3 and Re2O3 over a wide range of conditions. In contrast, there are no equilibrium fields for TcO3 or Tc2O3 . Furthermore, the reduction of Re from +7 to +4 is more difficult than for Tc [55–57]. Radionuclides Pu and 237Np used in the batch sorption solutions were from existing stocks at Lawrence Livermore National Laboratory. Standard Reference Materials, SRM 4288A for 99Tc, SRM 4341 for 237Np, and SRM 4334H for 242Pu, obtained from the National Institute of Standards and Technology, were used to prepare the standard solution to calibrate the ICP-MS instrument for measuring the radionuclide concentrations in the batch-sorption samples. The first batch test (Test A in Table 3) was carried out under atmospheric conditions. The test was conducted in accordance with ASTM method D4646 , except that a solution to solid ratio of 5:1 (one gram of air-dry solid to 5 mL of sorption solution) was employed instead of the 20:1 ratio specified in the ASTM method. All sorption treatments (solid and sorption solution) were run in triplicate. Blank (solid and background solution) and control (no solid; only sorption solution) treatments were run in duplicate. A 0.7 m3 glove box was used to modify and control the atmospheric composition for the other batch sorption experiments (Tests B-E). Either high purity Ar or a mixture of 99% Ar and 1% CO2 was used to control the atmosphere composition inside the glove box. Tests B and C were conducted under a gas composition of about 1 and 0.1% O2, controlled by maintaining the flow rate (pressure) of the pure Ar gas. Tests D and E were all conducted at 0.1% O2 level, with test tubes further spiked with a reductant (FeCl2 for Test D or Na2S for Test E) (Table 3). Two gas sensors were placed inside the glove box to monitor air composition. The oxygen sensor (Pro O2 analyzer, Nuvair Gas Analyzers, Oxnard, CA) has a detection limit of 0.1% O2. A CO2/temperature sensor (Model 7001, Telaire, Goleta, CA) was used to monitor the concomitant decrease of CO2 with O2 and to confirm the decreased O2 level inside the glove box. The CO2 sensor (working range of ~400 to 1 ppm) is more sensitive than the O2 sensor (working range of 21 to 0.1%). The experimental temperature was 22.9 ± 0.5°C. During the sorption experiments conducted inside the glove box, 15-mL sized centrifuge tubes were uncovered to permit gas exchange and placed on a shaker (Maxi-Mix III type 65800, Thermolyne, Dubuque, IA) at a shaker speed of 1,000 rpm. Batch tests were started when the O2 level inside the glove box reached steady-state levels, usually after flushing for 2–4 hours. Then after 48 hours, batch sorption tests were stopped and the sample was filtered with a 0.2 μm PTFE membrane syringe filter (Acrodisc CR 13 mm, Pall Life Sciences, East Hills, NY). The sorption kinetics of radionuclides and the limited mixing during sorption experiments was not evaluated, as this study was intended to compare the effects of redox conditions on sorption under otherwise similar experimental conditions. Furthermore, redox reactions can be kinetically limited, requiring timescales on the order of weeks to achieve steady state . Consequently, observations at 48 hours may not capture the full extent of the redox manipulation. Comparative effects between samples at 48 hours address the initial response of radionuclides to abrupt redox changes. An aliquot of filtrate (0.5 mL) was pipetted into 3.5 mL 2% HNO3 solution for subsequent ICP-MS (Thermo Electron Model X7, Thermo Fisher Scientific, Inc, Waltham, MA) analysis of all elements of interest; 5 ng/L of 6Li, 45Sc, 115In, and 209Bi were included as internal standards. The redox potential, relative to the standard hydrogen electrode, was measured using platinum as a sensing electrode and silver-silver chloride as a reference electrode (Thermo Orion Eh combination electrode, model 9678BN, Thermo Fisher Scientific, Inc, Waltham, MA) filled with saturated potassium chloride. Standard Zobell's solution (a solution of potassium ferric-ferrocyanide of known Eh) was used to verify the working operation of the measurement system . Measurement of pH for the filtrate was conducted using an Oakton meter (Eutech Instruments, Singapore) and glass pH electrode system (Orion Ross combination pH electrode, model 81-02) calibrated to three pH buffer standards (pH 4, 7, and 10). Dissolved oxygen in the filtrate was evaluated with a SympHony SB50D (Thermo Orion) with a detection limit of 0.1 mg/L. All these measurements, except for ICP-MS analyses, were performed inside the glove box under the desired O2 level. The principal redox couples in the subsurface are O2/H2O, NO3-/N2, Mn(IV, III)/Mn(II), Fe(III)/Fe(II), SO42-/H2S, and CO2/CH4, which form a redox ladder from the most oxidizing O2/H2O to the reducing CO2/CH4couples. 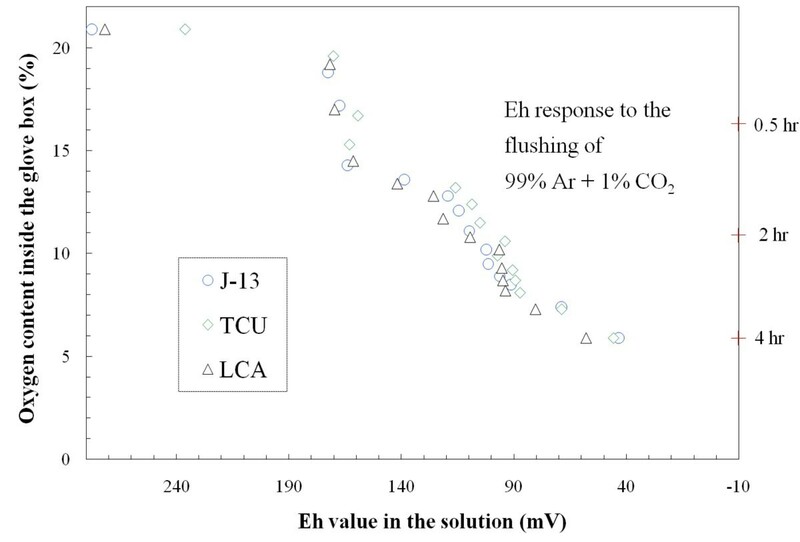 The theoretical (thermodynamically calculated) Eh values at pH 7 are 816, -182, and -215 mV for the O2/H2O, Fe(III)/Fe(II), and SO42-/H2S redox couples employed in this study. However, various authors suggest caution in using Eh to quantify redox condition [61, 62]. The difficulty in interpreting redox from Eh measurements results from using an equilibrium approach to describe a highly dynamic system . 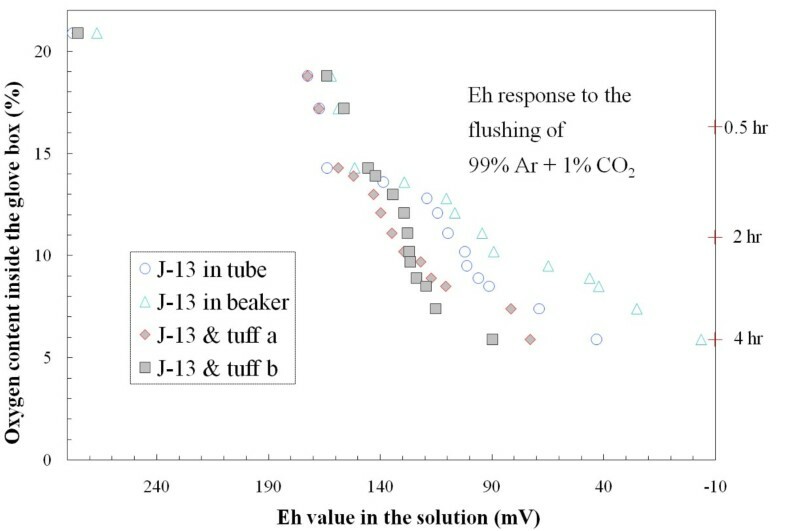 Eh is a simple measure, but it gives at best only qualitative assessment of water redox conditions because the Pt electrode may not respond to many important redox couples . Thus, a wide range of Eh has been observed for the same redox couple and, as a result, several redox reactions may be relevant within the same Eh range . The measured Eh usually reflects "non-equilibrium" potentials and can only be qualitatively interpreted. Supplementary measurements of redox couple concentrations should be made in addition to Eh measurements to better evaluate redox conditions. this amount was equivalent to 0.67 mg/L sulfide (S2-) being oxidized and suggested that sufficient sulfide remained in solution to influence redox conditions. We first evaluated the approach of producing and maintaining different redox conditions in the radionuclide-aquifer-groundwater system by controlling the air composition inside a glove box. This was accomplished by replacing the ambient air with 1% CO2 in Ar. The change of oxygen content as a function of flow rate was controlled by adjusting incoming gas pressure; a steady-state level of O2 inside the glove box was reached at about 2 hours under 10 psi and at 4 hours under 1 psi. Figures 6, 7 show the change of solution Eh in response to the flushing-out process of air inside a glove box. The Eh was periodically measured in background solutions, and all three background solutions exhibited a similar trend (i.e., similar behavior in redox buffering) (Figure 6). Figure 7 shows the effect of gas-water interface area and the redox buffering capacity of the crushed rock (devitrified tuff, in this case). As expected, J-13 water placed in a centrifuge tube (1.8 cm2 gas-water interface) responded, in terms of solution Eh, more slowly than that in a beaker with a gas-water interface area 9 times larger. The presence of solids (devitrified tuff, which provides buffering capacity) contributed to the maintenance of a higher solution Eh. Limited measurements of solution pH in J-13 water showed a slight decrease from 7.91 at 20.9% O2 to 7.67 at 10.3% O2, while pH value for J-13 and devitrified tuff at the same O2 levels decreased from 8.0 to 7.2. Change of solution Eh in response to the gas composition (99% Ar and 1% CO 2 ) inside the glove box for three different background solutions. Change of solution Eh in response to the gas composition (99% Ar and 1% CO 2 ) inside the glove box for J-13 water and devitrified tuff ( tuff a and tuff b are duplicate runs inside centrifuge tubes). The test demonstrates the feasibility of achieving a range of more than 200 mV in Eh under these experimental condition; further reduction can be obtained by applying a reductant (FeCl2 or Na2S) in the sorption system. For Tests D and E, a small amount of FeCl2 or Na2S was added into the sorption solution, and pH was adjusted (with either NH4OH and/or HNO3) to be the same as the value before the spiking of the reductant. Table 4 and Figures 8, 9, 10, 11, 12, 13, 14 present the measured K d s (average ± standard deviation for triplicates) of each radionuclide onto four different aquifers under six different redox conditions. The measured values were not necessarily the sorption coefficients at equilibration; the objective of these experiments was to study the relative effect of redox condition on radionuclide sorption under otherwise similar conditions. Change of Sr K d values under five different redox conditions for different aquifer materials. Change of Cs K d values under five different redox conditions for different aquifer materials. Change of 99 Tc K d values under five different redox conditions for different aquifer materials. Change of iodine K d values under five different redox conditions for different aquifer materials. Change of 237 Np K d values under five different redox conditions for different aquifer materials. Change of U K d values under five different redox conditions for different aquifer materials. Change of 242 Pu K d values under five different redox conditions for different aquifer materials. By modifying the air composition and adding a reductant, we achieved an Eh range of nearly 400 mV from Tests A to E measured at the end of 48 hours experimental duration (Table 5). As expected, for elements that were insensitive to redox conditions (i.e., Sr and Cs), K d values generally did not vary as a function of Eh for all four radionuclide-aquifer-groundwater systems (Table 4 and Figures 8, 9); observed small differences for carbonate and zeolitic tuff were probably related to the sample and analytical variability. Compared to the change in Eh, values of pH among all treatments were relatively stable (Table 6). Under atmospheric (oxidizing) conditions (Test A), measured Sr sorption is moderate in alluvium and devitrified tuff, strong in zeolitic tuff, and weak in carbonate (Figure 8). 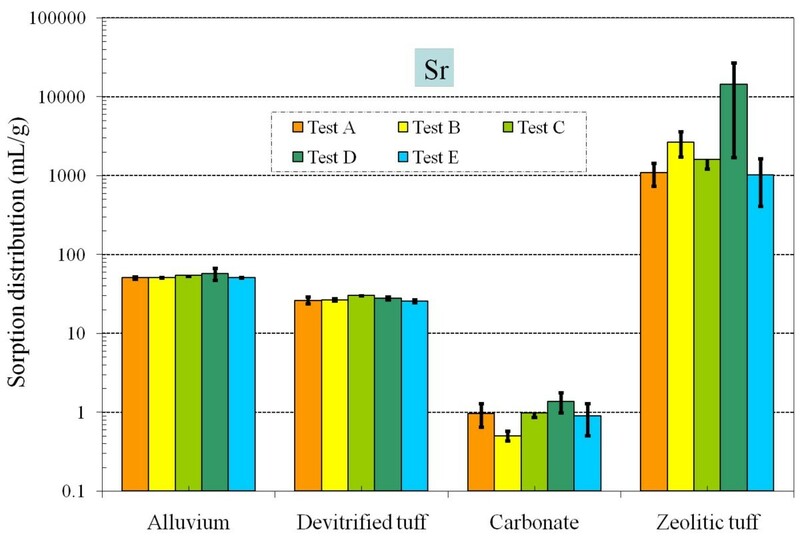 Cs sorption patterns are similar to those of Sr, being the strongest in alluvium, moderate in devitrified and zeolitic tuff, and very weak in carbonate (Figure 9). 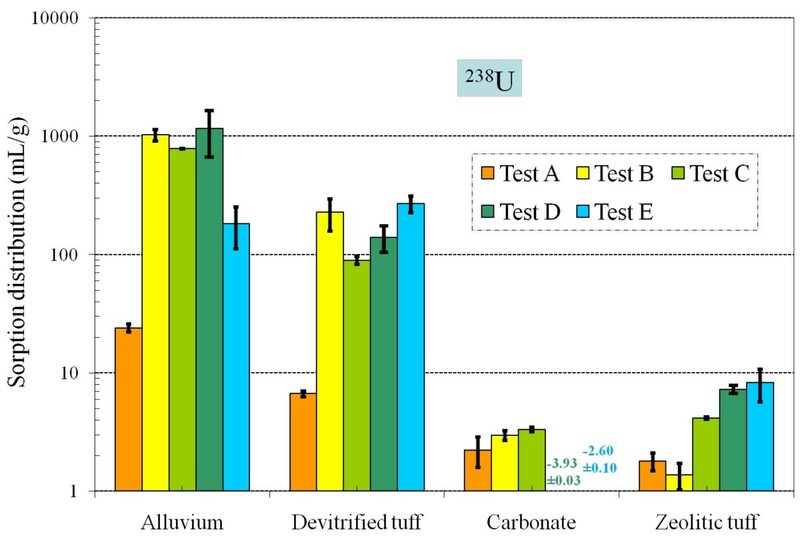 a The alluvium/J-13 control is also applicable for devitrified tuff/J-13 treatment. hydrolytic adsorption of TcO(OH)2° on iron (III) hydroxide or coprecipitation with Fe(III) by formation of hydroxo complexes containing Fe-O-Tc bonds can be expected. Once TcO4- has been reduced, precipitation or coprecipitation of Tc2S7 may occur if H2S or S2- ions are present and the solubility product of the sparingly soluble Tc2S7 has been exceeded. Non-zero Tc K d values were measured in all media except alluvium. For devitrified tuff, the Tc K d value in Test E was 300 times higher than in Test A. It is not clear why the Eh decrease to a moderately reducing condition only has an effect on 99Tc sorption/precipitation in devitrified tuff. We spectulate that a combination of factors contribute to the observed effect, and these factors include changes in the sorbate (redox speciation), the sorbent (surface property alteration), and the water chemistry (such as pH and Fe2+/S2- concentrations). It is possible that the devitrified tuff has a trace amount of reducing mineral (e.g., pyrite) that is not measurable by X-ray diffraction. The Fe2O3 content (wt %) measured by X-ray fluorescence was reported to be 0.96 ± 0.092 for devitrified and 0.84 for zeolitic tuff, respectively . 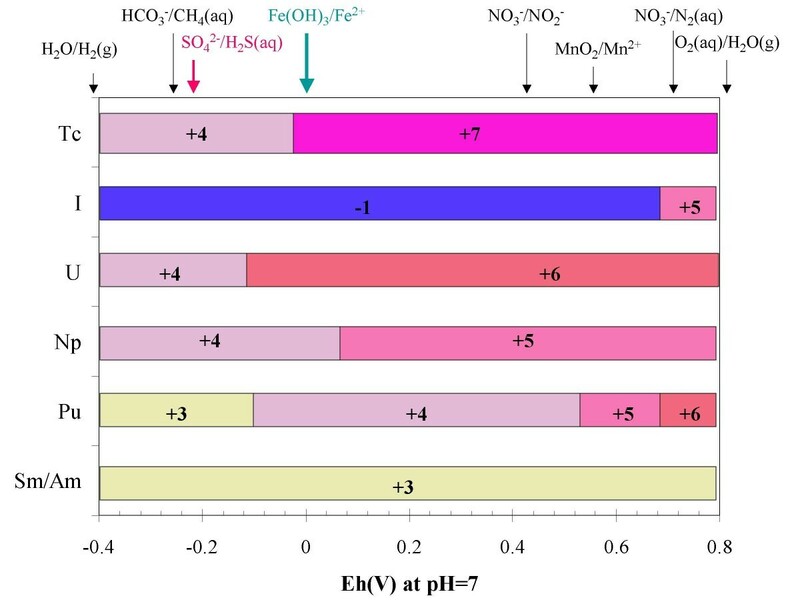 The four aquifer materials had different aqueous iron concentrations after contact with background water, and also exhibited different response to added Fe2+ (Table 7). Both alluvium and devitrified tuff released some iron, but the alluvium seemed to be able to sorb added Fe2+ very effectively. 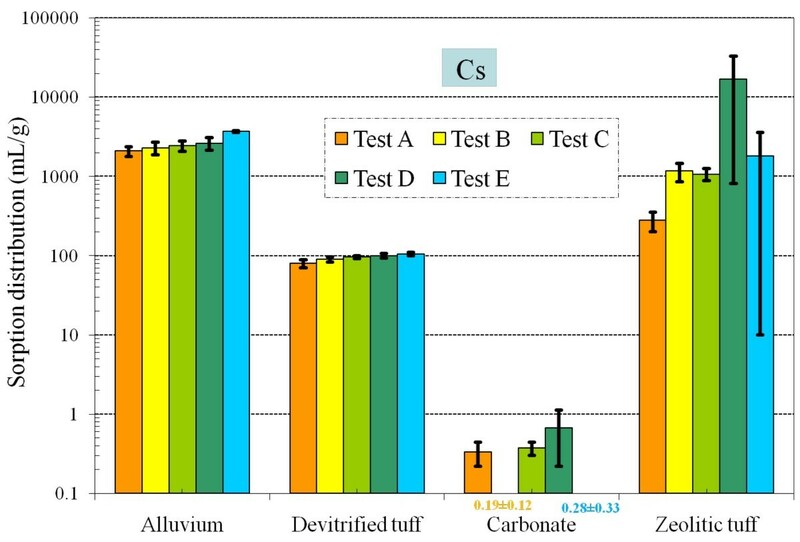 Carbonate rock appeared to have effectively sorbed the added Fe2+ in Test D. Zeolitic tuff could release significant amounts of iron, and the amount released decreases from Tests A to C with an associated decrease in Eh value. a ND: not detected; below the detection limit of about 5 μg/L. b"11 ppm" FeCl2 was added into both background and tracer sorption solutions used in Test D. Measured Fe2+ concentrations in the control samples are in the range of 0.2 to 1 ppm, which is consistent with the excepted dissolved Fe2+ concentrations from Geochemist's Workbench; the Fe2+ in solution is controlled by the solubility of FeCO3 and/or Fe(OH)2. 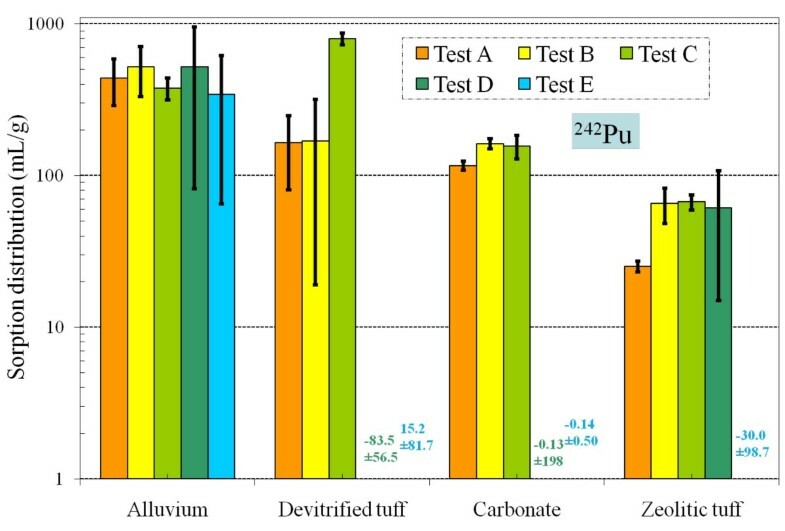 For the interaction of Tc with alluvium, there was essentially no sorption in Tests A to D (Table 4a). The measurable, though small, sorption of Tc in Test E for alluvium and zeolitic tuff suggested that Tc will be slightly retarded if the radionuclide encounters a reducing zone along its flowpath. Some level of iodine (applied as iodide) sorption was observed in nearly all samples (K d = 0 - 0.99 mL/g). However, this sorption did not appear to be correlated with redox (Figure 11), therefore, some iodine retardation could help limit its transport in the subsurface at the NTS at any redox condition. Furthermore, the range of K d is substantially lower (and narrower) than the range proposed in Table 1, which is from the literature values confounded by iodine speciation (discussed in Background). 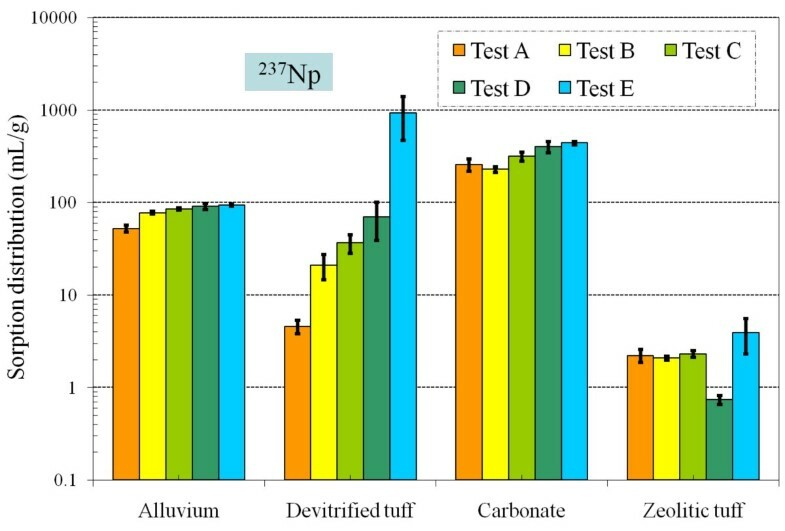 Under the atmospheric conditions, Np sorption is the strongest in carbonate rock, moderately strong in alluvium, and moderately weak in devitrified and zeolitic tuff, which is consistent with the literature . Sorption of Np in devitrified tuff increased significantly with decreasing Eh; the Np K d value in Test E was 200 times higher than in Test A. It appears that a substantial quantity of Np(V) was reduced to Np(IV), leading to a strong retention similar to Pu(IV). This suggests that Np may be substantially retarded in mildly reducing groundwater conditions, contrary to most Np transport predictions which assume that Np remains in the +5 oxidation state. Conversely, there was little change in Np sorption on alluvium and carbonate aquifer materials as a function of redox condition, which implies strong Np sorption to minerals in these two materials (e.g., calcite). Similar to what we obtained for Test A under atmospheric condition, low K d values have been reported for Np in tuff , while nearly two orders of magnitude larger K d values were reported in carbonate ; Figure 12 shows a similar trend. 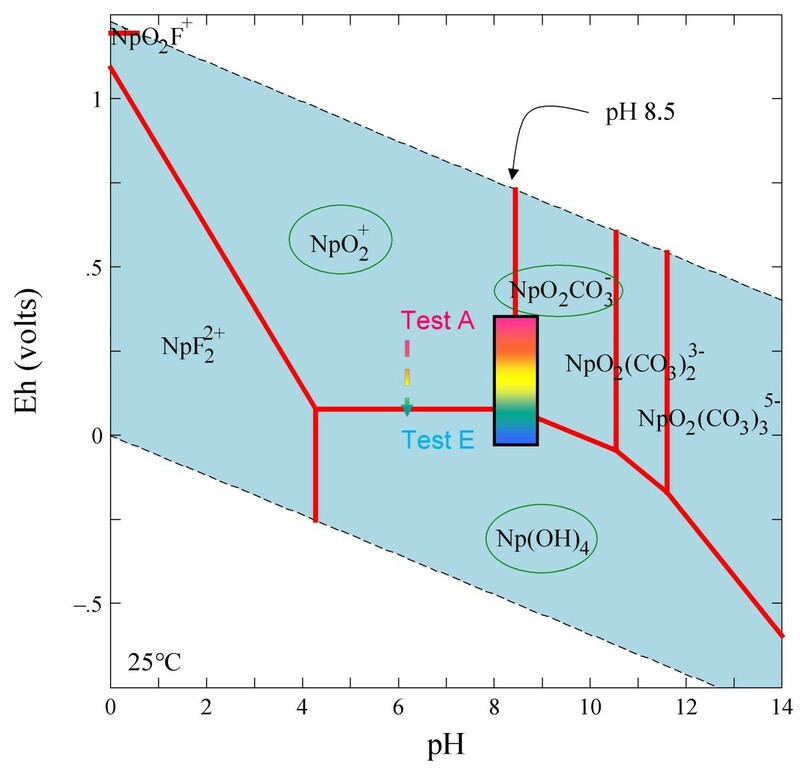 Figure 15 presents the experimental Eh-pH ranges studied in this work overlaid on Np stability field plots for Np in LCA water. The likely Np species encountered in J-13 water would include NpO2CO3-, NpO2+, and Np(OH)4 (Figure 3). The reduced Np(OH)4 species is likely to sorb (or precipitate) much more strongly than the oxidized species, which is consistent with our observations of an increasing trend of Np K d with decreasing Eh for devitrified tuff in J-13 water (Figure 3). 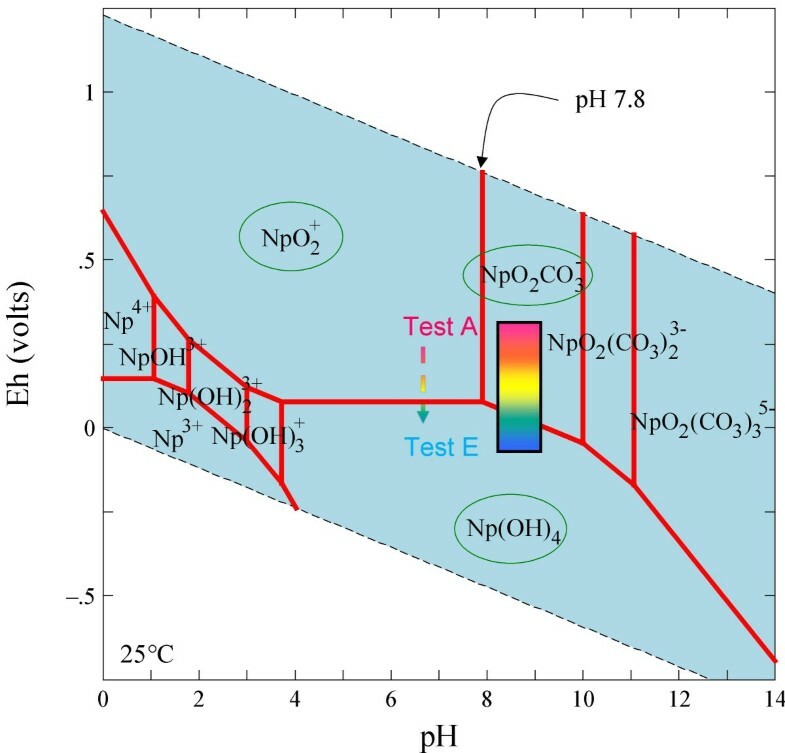 For Np sorption in carbonate (Figure 15), NpO2CO3- and NpO2+ species might have as strong an interaction with carbonate minerals as Np(OH)4 species, which would minimize the effect of Eh (Figure 12). Stability fields of Np species in Eh-pH diagram for LCA waters. Overall, uranium K d values in Tests B to E for alluvium, devitrified tuff, and zeolitic tuff (except for Test B) were larger than in Test A, which was conducted under atmospheric conditions (Figure 13 and Table 4C). Measured uranium K d s to carbonate in Tests D and E were negative (-3.9 and -2.6 mL/g, respectively). Low initial U concentrations in spiked blanks (Table 2b) suggest that precipitation of uranium or losses to container walls had an effect on these samples. The low initial iodine and Pu concentrations in spiked blanks for Tests D and E were also observed (Table 2b). The addition of a reductant consistently affected the initial solution concentrations of U, I, and Pu more than other elements (Table 2); reducing conditions exacerbate issues regarding precipitation or sorption to container walls for these elements. HS- + UO22+ = UO2 + S0 + H+. The kinetics of U(VI) reduction was found to be largely controlled by the total carbonate concentration and pH. They further concluded that uranium-hydroxyl species, not the dominant U-carbonate species, were the ones being reduced by sulfide. Our experiments suggest that a combination of water chemistry and rock mineralogy will affect the efficiency of sulfide-promoted U(VI) reduction. Compared to other tests, sorption of Pu is more variable for Tests D and E and most likely the result of Pu loss to container walls, as described earlier. Overall, Pu sorption seems not to be significantly affected by the decreasing redox conditions achieved in this study (Figure 14). This is especially evident for alluvium and zeolitic tuff samples. The predominant Pu species at all redox conditions was the sparingly-soluble and strongly sorbing Pu(OH)4 (Figure 4). At low pH (< 7) and highly reducing conditions, Pu may exist as Pu(III). However, this species is also a very strong sorber. 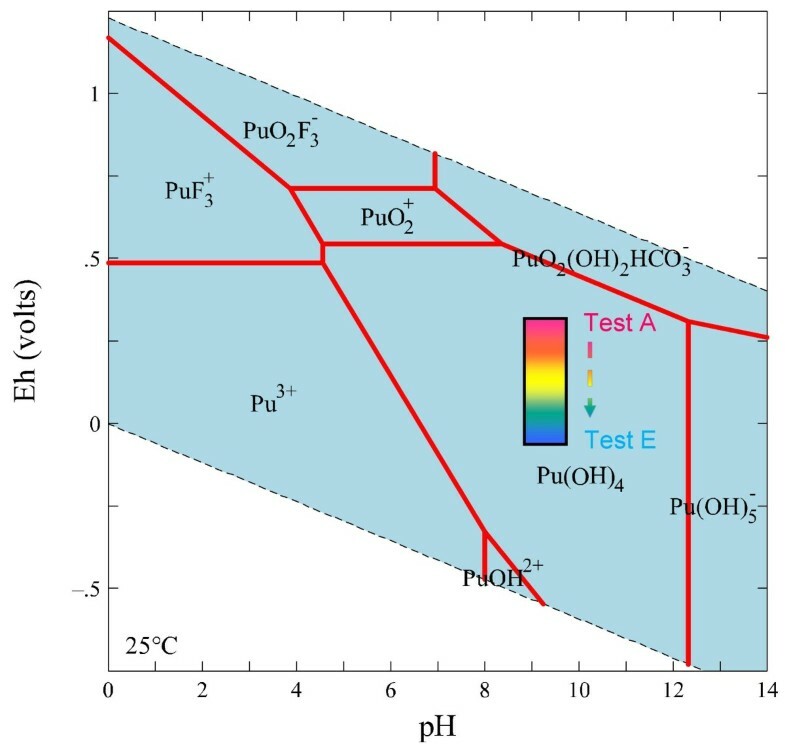 Overall, Pu sorption onto NTS aquifers is much less affected by redox than other redox-sensitive radionuclides. • Laboratory batch-sorption experiments showed markedly greater retardation for 99Tc and 237Np in devitrified tuff under reducing conditions. Retardation of radionuclides as a function of redox condition is particularly important for 99Tc, which would be highly mobile under oxidizing conditions. The 99Tc K d in devitrified tuff correlated with redox, increasing from 1.22 to 378 mL/g from oxidizing to mildly reducing. 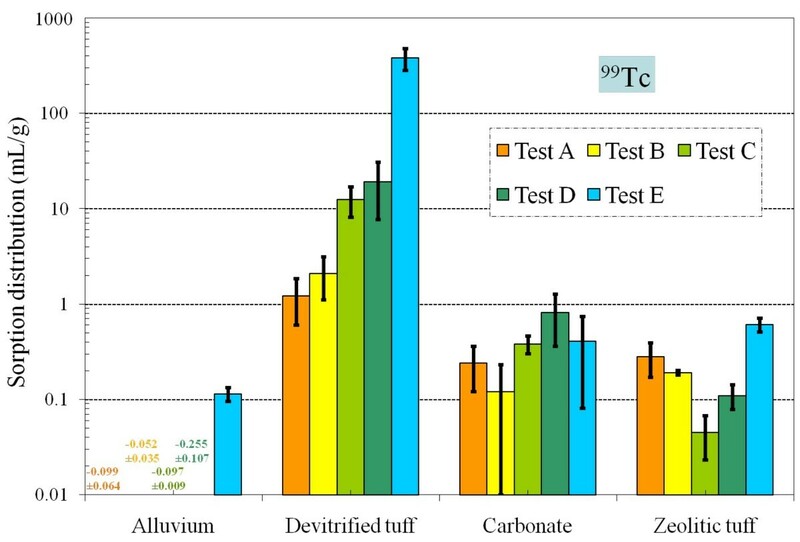 Under oxidizing conditions, measured 99Tc K d values were 0.12–0.81 mL/g in carbonate rock, 0.045–0.61 mL/g in zeolitic tuff, and ~0 mL/g in alluvium. 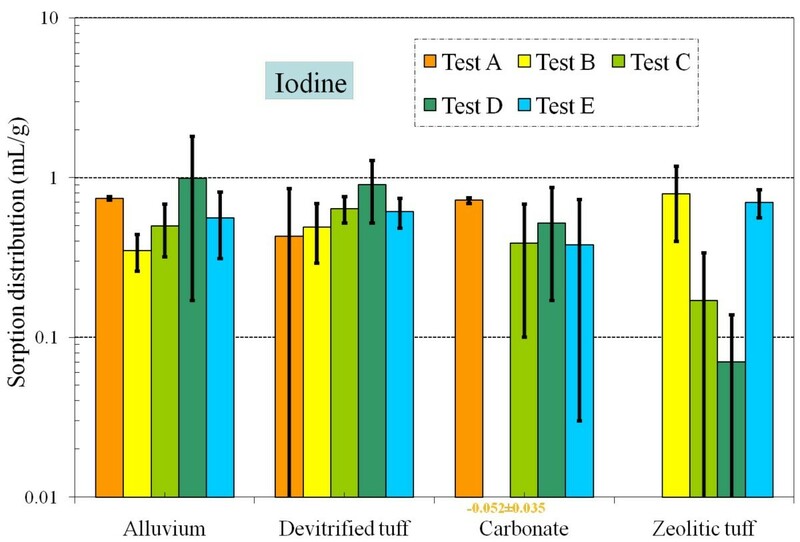 • Under the experimental conditions, values for K d of iodine are generally not correlated with redox; K d s were 0.33–0.99, 0.43–0.90, 0–0.72 and 0–0.79 mL/g for alluvium, devitrified tuff, carbonate, and zeolitic tuff. Importantly, a non-zero K d was observed in all samples, suggesting that 129I transport will be retarded. Including the measurable K d for129I iodine would result in less conservative and more realistic radionuclide transport predictions. • The Np K d strongly correlated with redox condition in devitrified tuff, with an increase from 4.6 to 930 mL/g as experimental conditions became more reducing. The probable reduction of Np(V) to Np(IV), and comparable K d to Pu(IV), under mildly reducing conditions has not been widely reported in the literature. • The overall trend showed that the sorption of U for alluvium, devitrified tuff, and zeolitic tuff under atmospheric conditions was smaller than the glove-box tests. • Sorption of Pu was not affected by the decreasing redox conditions achieved in this study, as the predominant Pu species in all conditions was expected to be sparingly-soluble and strongly sorptive Pu(OH)4. The probable presence of reducing groundwater zones in the subsurface could potentially contribute to the retardation of some redox-sensitive radionuclides. Understanding of redox conditions on the transport of redox-sensitive radionuclides garnered from this study at the NTS is very important in assessing potential contaminant mobility and developing remediation strategy in other contaminated sites. Funding for this investigation was provided by the Environment Restoration Division's Underground Test Area Project at the US Department of Energy, National Nuclear Security Administration, Nevada Site Office. This work was performed under the auspices of the U.S. Department of Energy by Lawrence Livermore National Laboratory (LLNL) under Contract DE-AC52-07NA27344. Helpful comments from the handling editor and three anonymous reviewers are also very much appreciated. QHH designed the tests, performed the experiments and speciation modeling, interpreted data, and drafted the manuscript, MZ was involved in data interpretation and revising the manuscript, and TPR assisted with data interpretation and revising the manuscript. All authors have approved the significance of the work, interpretation of results, and contents of the final manuscript.